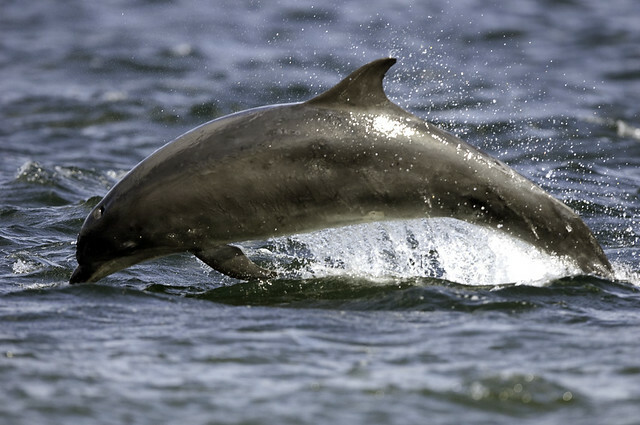 Bottlenose dolphin. Photo by Peter Asprey, Scotland. Creative Commons. A group of researchers led by Brian Branstetter, of the National Marine Mammal Foundation, conducted the experiment on two bottlenose dolphins: a 30 year-old female (SAY) and a 26-year-old male (NAY) in a portable floating pen in the San Diego Bay. Each dolphin was trained to monitor the pen for electronically simulated (“phantom”) targets in eight different locations and press a response paddle when they detected them. The experiment took place over three, five-day sessions. As the PLoS one article states, “The dolphins would have no knowledge of where or when a phantom target would occur and would have to continuously echolocate on the eight stations to detect a phantom target.” Trainers reinforced correct responses with fish. SAY was 96 to 99 percent accurate in detecting echoes from the research project’s “phantom echo generator.” NAY was 75 to 86 percent accurate. Because of her “superior performance,” SAY was selected for another 15-day test. She continued to echolocate successfully during that time. So why are dolphins peppier than the rest of us? I think it’s time to set aside my jealousy. At least I can sleep well, knowing there are no sharks about. This entry was posted in Biology, Dolphins and tagged Animal echolocation, Dolphin, Marine mammal, research, shark, sleep, unihemispheric sleep by Susan Frith. Bookmark the permalink.